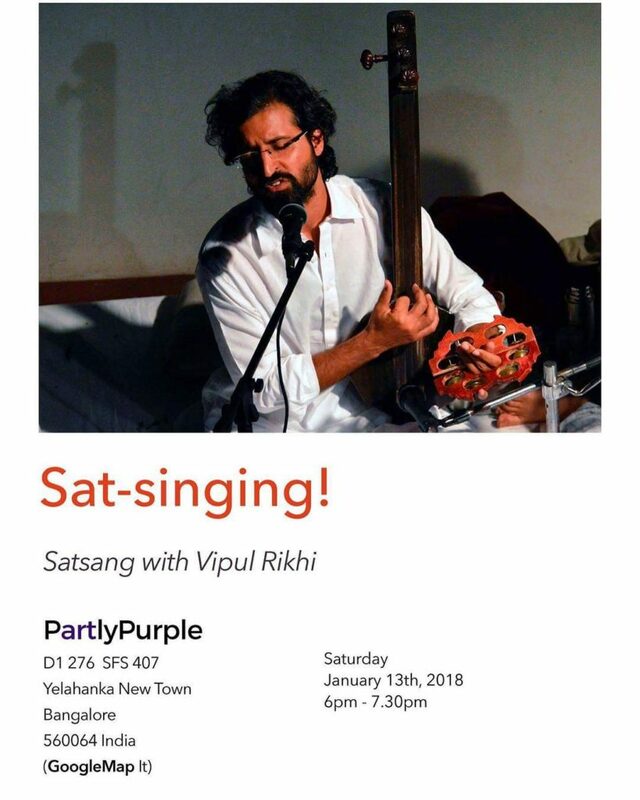 This performance-talk explores the idea and practice of nirgun Bhakti poetry and music as dissent, not just in the sense of offering social commentary and critique around caste and religious oppressions and corruptions, but equally in basing this critique firmly in a sense of the sacred. How does an attitude of reverence impact our understanding of ourselves and of the world? Do we need to question only mainstream fundamentalisms, or could we also cultivate a sense of self-interrogation? What is our own relationship with the sacred? Sunday Morning Satsang at the Courtyard! 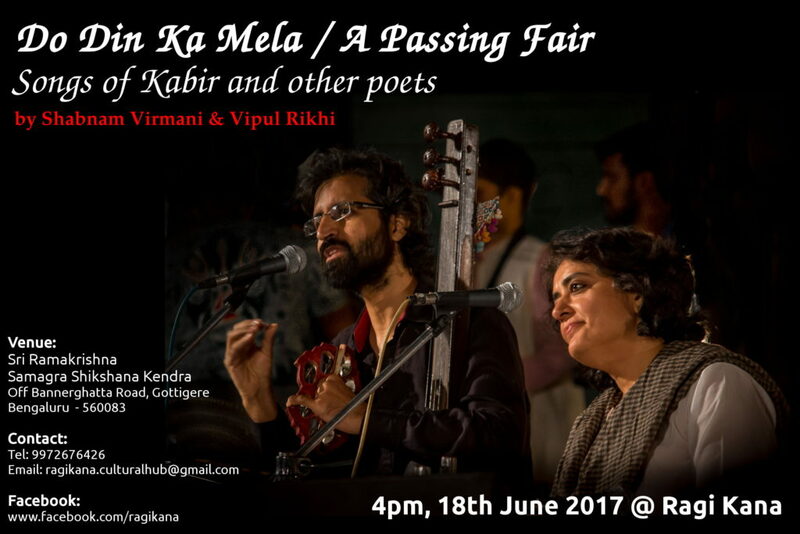 Come for a Sunday morning immersion into yourself through the striking poetry and folk melodies of Kabir and other Bhakti and Sufi poets. Vipul will share songs from Malwa, Rajasthan, Kutch and other places, which speak of profound truths with great beauty and simplicity. 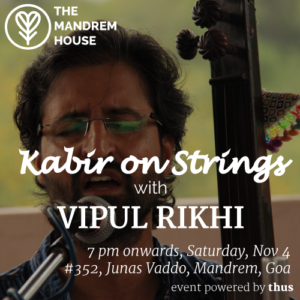 Vipul Rikhi writes, translates, sings, plays and performs. 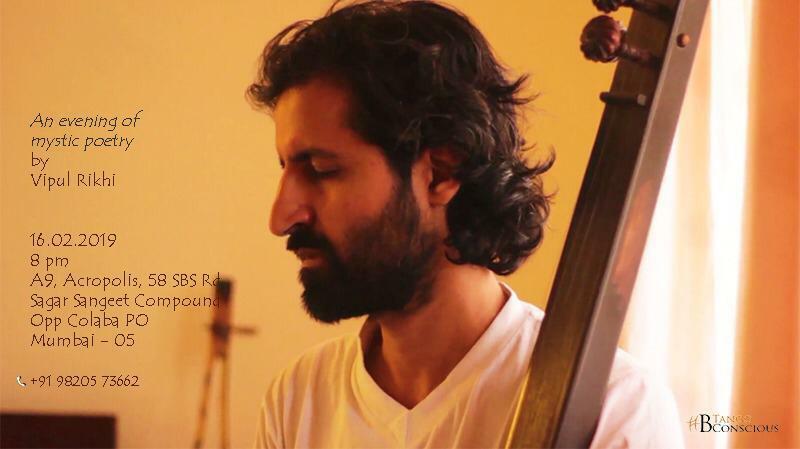 He is a co-creator of ‘Ajab Shahar’, a vast digital archive of Bhakti, Sufi and Baul music. His work with Kabir Project includes extensive writings and translations in the area of mystic poetry, including forthcoming books. In the course of these journeys he has developed a deep love for singing mystic poetry in the folk music traditions. 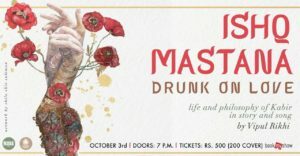 In his performances, he likes to bring equal emphasis to the poetry and its insights as to the sheer beauty of the folk tunes. He was a Fellow for Literature at the Akademie Schloss Solitude in Germany in 2010-11, and is the author of a novel, 2012 Nights, and collections of poetry and short stories. 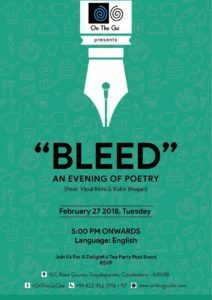 His latest book is Bleed. 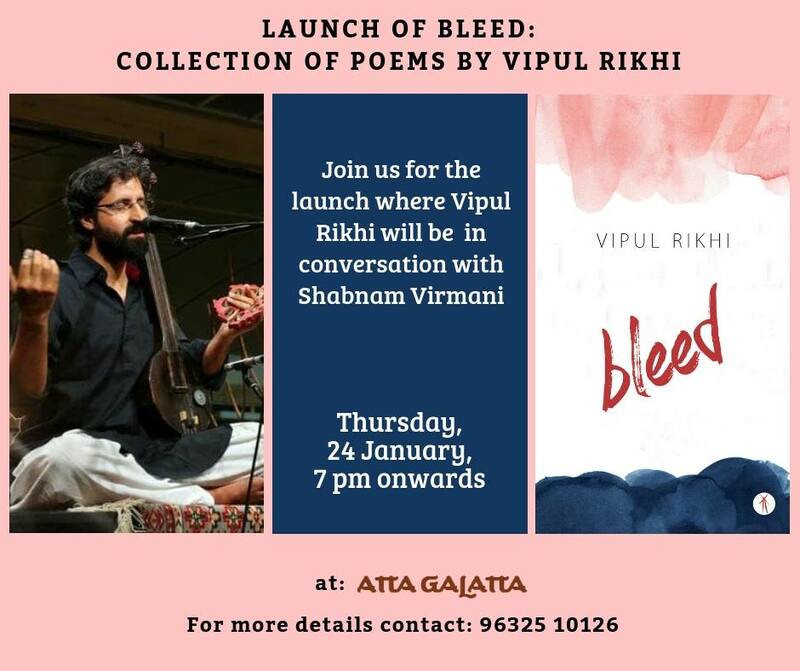 Launch of ‘Bleed’, published by Hawakal Prokashana, at the lovely Atta Galatta Koramangala in Bangalore. I will be reading poems and will be in conversation with Shabnam, exploring ideas, thoughts and feelings around poetry, creation, self and space. 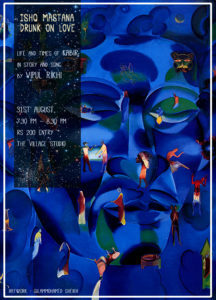 Do come if you’re in Bangalore and share with other lovers of poetry. 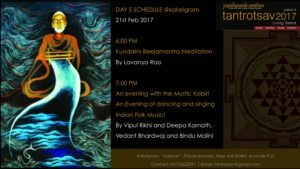 An introduction to the enigmatic, iconoclastic 15th century Bhakti-Sufi poet, Kabir, through storytelling, commentary, poetry and songs. The songs are in dialects of Hindi and the entire narration will be in English. Why the life of Kabir? Over 500 years after his lifetime, Kabir still speaks to our times. 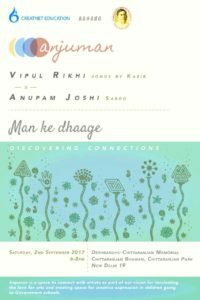 In simple, direct words, Kabir addresses complex emotional and cultural issues, with deep insight and clarity. But who was Kabir? How and where did he live? What made him who he was? Was he just one person or has he become many? Exploring legends around his life, his poetry, the depth of his thought, and the beauty of the music that has sprung up around him, we take a journey into the heart of this unique phenomenon. In the 20th century, Gandhi ji reminded us with great force and beauty of our civilisational virtue of ahimsa or non-violence. What is the mystic view of violence and its absence? What do Kabir and other mystic poets say about the subtle kinds of violence that we might, consciously and unconsciously, inflict on ourselves and on others? And what might be the dynamics between the presence of love, or “prem”, and the absence of violence? 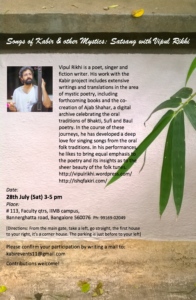 In a freewheeling, non-didactic and open conversation, interspersed with dohas and songs from the oral folk mystic traditions, Vipul will attempt to explore some of these ideas in collaboration with everyone present. 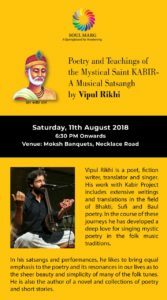 An introduction to the enigmatic, iconoclastic15th century Bhakti-Sufi poet, Kabir, through storytelling, commentary, poetry and songs. The songs are in dialects of Hindi and the entire narration will be in English. What does it mean to ‘wake up’, as Kabir & others often urge us to do? In what ways are we ‘asleep’? Through songs and conversations, we explore ideas & poetry around awareness, forgetfulness, being unconscious & being awake! At Srijan School of Music, Indirapuram, Ghaziabad, UP. On Sunday 22 July, 11am to 5pm. 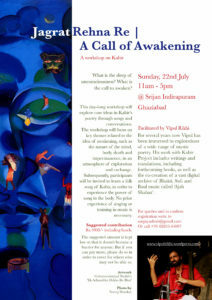 A day-long workshop exploring the core ideas in Kabir’s poetry through songs, poetry and conversations. 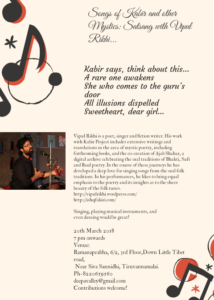 The workshop will focus on key themes that appear in Kabir’s poetry, such as love, mind, body, death, simplicity and awareness, in an atmosphere of exploration and exchange. 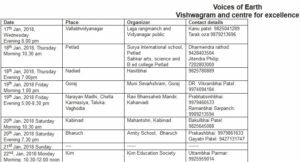 Subsequently, participants will be invited to learn a folk song of Kabir, in order to experience the power of song in the body. No prior experience of singing or training in music is necessary. 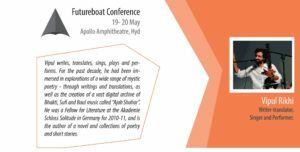 Speaking and singing session on Love and Kabir, as part of the FutureBoat conference. Venue: Apollo amphitheatre, Jubilee Hills, Hyderabad. Date and time: Saturday, 19 May, 5.30-10.30 pm. 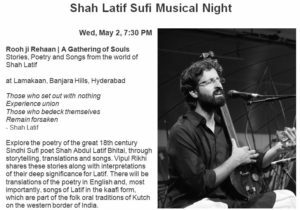 Stories, poetry and songs from the world of Shah Latif. Kabir was a supremely iconoclastic voice, whose songs remain vibrantly alive today almost 600 years later. A quintessential folk voice, he burst into the classical tradition through the inspired genius of Pt Kumar Gandharva, who was himself deeply inspired by the folk oral traditions of Malwa. 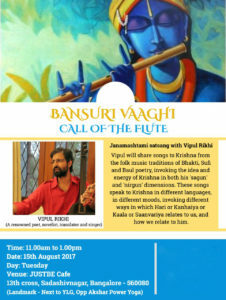 Vipul will sing Kumar ji’s Kabir as well as a few folk compositions. 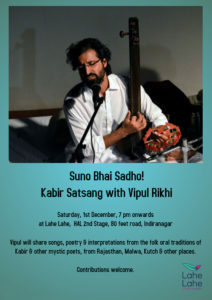 An evening of Kabir on the banks of the Ganga. Part of the silver jubilee celebrations of Prerna Kala Manch. Date & time: 24 March, 6 pm. 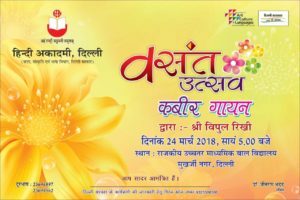 A program organised by the Hindi Academy, near Delhi University North Campus. For the last 2 years, at around this time, we have been going for a yatra in small towns and villages of Gujarat, sharing the poetry of various Bhakti and Sufi poets, and the power of the sung word, or Shabad. The first yatra was in north Gujarat two years ago. Last year it was in Saurashtra. This year’s yatra is in central and south Gujarat, with interesting sounding places such as Petlaj, Kim and Kabirvad! 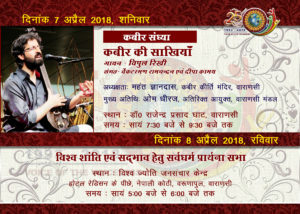 Organised by Vishwagram, an NGO based in Gujarat, the sharing of Bhakti music takes place in conjunction with talks on Sufism given by Arif Mohammad Khan, and also songs by local bhajnik mandalis, to both of whom we listen with great eagerness and attention, as it always brings about a rich exchange. A session with the students, teachers and parents at Shikshantar School. Kabir urges us to read the four letters of love in order to be wise. Kabir and other Bhakti and Sufi poets like Bulleshah and Meera speak of impermanence, death, love, joy and the nature of human life and existence, in their songs. 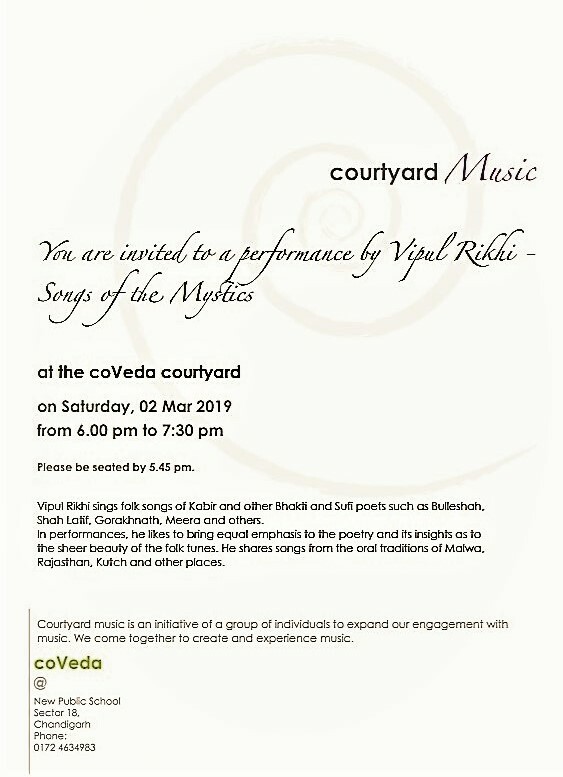 Vipul will share some of these songs, which he has encountered during his journeys into the folk oral traditions of Bhakti, Sufi and Baul poetry. These folk songs from different regions of the country speak with startling clarity, and yet with great feeling, about the fundamental truths of human life. 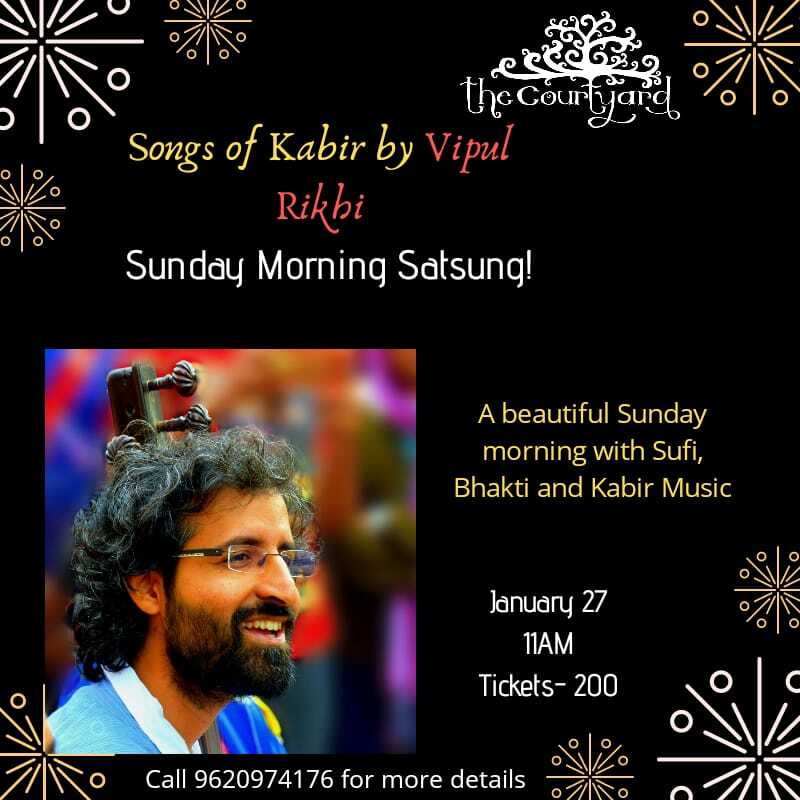 Presented by Hyderabad Trails, this is gifted Kabir singer Vipul Rikhi’s second visit to our venue this year. 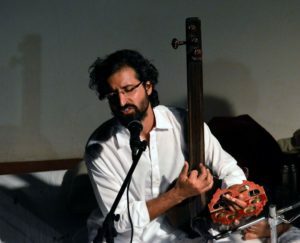 Vipul Rikhi is a poet, novelist, translator and singer, and a co-creator of Ajab Shahar, a forthcoming digital archive that celebrates the oral traditions of Bhakti, Sufi and Baul music and poetry. His work with Kabir Project includes extensive writings and translations in the area of mystic poetry. In the course of these journeys he has developed a deep love for singing mystic poetry in the folk music traditions. 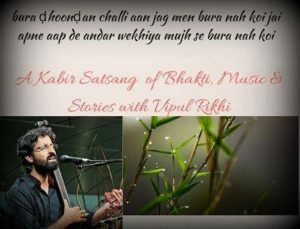 In his satsangs and performances, he likes to bring equal emphasis to the poetry and its resonances in our lives as to the sheer beauty and simplicity of the folk tunes. He is also the author of a novel and collections of poetry and short stories. 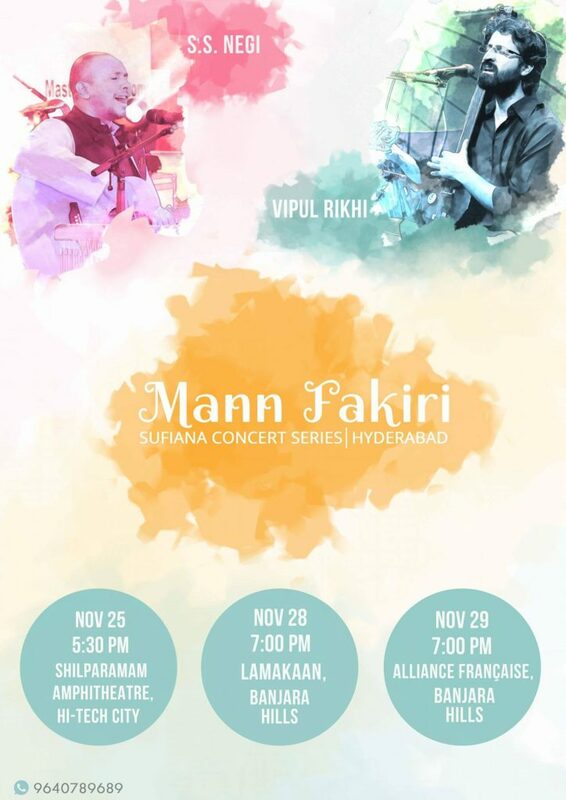 A concert series with two artists at three different venues in Hyderabad. 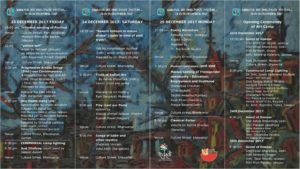 On 25, 28 and 29 November. How do we understand or relate to the current climate of aggressive ‘nationalism’, and are there different models for expressing and sharing a love of the country? This talk by Vipul Rikhi touches on aspects of insecurity and identity crisis which may lie at the root of streaks of assertion and aggression by which the ‘nation’ is sought to be defined. Drawing upon local wisdom traditions and figures such as Kabir and Tagore, the talk aims to offer a broader understanding of self as well as country, and how the two may be related. 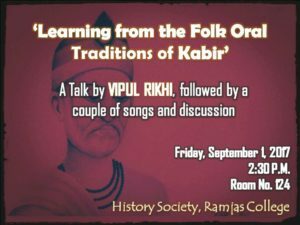 The talk will be followed by some songs of Kabir, performed by Vipul Rikhi. Kabir’s voice is iconic for its fearlessness in speaking truth to power. 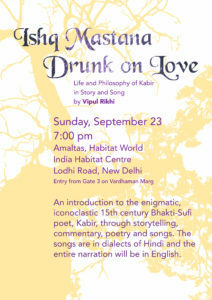 Vipul will share some songs of Kabir which speak of his truth. 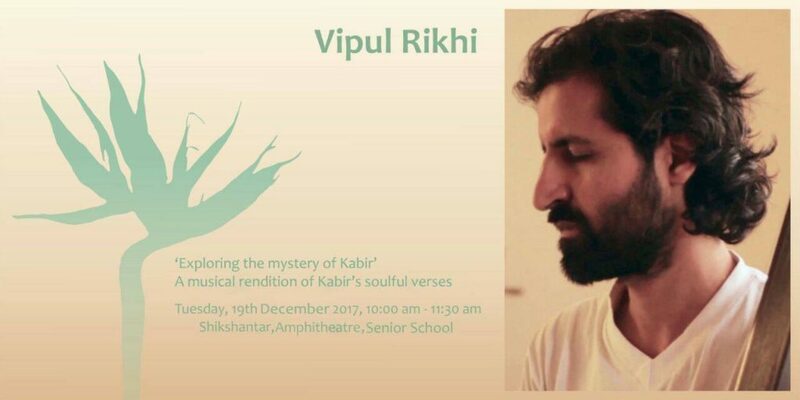 Vipul Rikhi is a poet, novelist, translator and singer, and a co-creator of Ajab Shahar, a forthcoming digital archive that celebrates the oral traditions of Bhakti, Sufi and Baul music and poetry. He is also the author of a novel and collections of poetry and short stories. This interactive evening is in continuation with our vision for inculcating the love for creative arts in our Government school children. We aspire to collaborate with specially young artists to take their art into government schools thereby creating self and art awareness in children. Please do come with your friends and family to grace the occasion. We operate on gift culture, so any amount from Rs 0 upto anything is welcome (though its not compulsory). All the contribution will go to the artists for giving their precious time. On the occasion of Janamashtami, a morning of songs to Hari, Kanhaiya, Govind, Gopal, Shyam, Kaala, Saanvariya, Mohan and all the other names that Krishna is known by in the folk traditions. Krishna stands for play (leela), multiplicity and diversity. In the nirgun traditions, Hari stands for the truth within oneself. How do we arrive into a space of allowing the multiplicity of forms outside, and the unity of truth within? 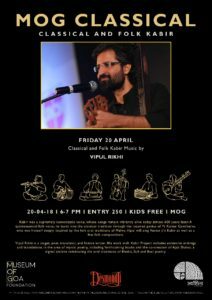 Vipul will share songs to Krishna from the folk music traditions of Bhakti, Sufi and Baul poetry, invoking the idea and energy of Krishna in both his ‘sagun’ and ‘nirgun’ dimensions. These songs speak to Krishna in different languages, in different moods, invoking different ways in which Hari or Kanhaiya or Kaala or Saanvariya relates to us, and how we relate to him. An intimate satsang on Sunday, 18 June, to support Ragi Kana – ರಾಗಿ ಕಣ. 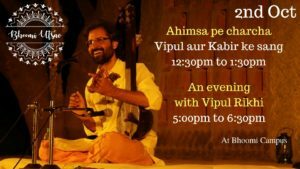 Once a month we gather with Vipul in Bangalore to learn a song of Kabir or another mystic poet, in the spirit of sharing, openness and togetherness. Entry is open and free, but restricted to a limited number of participants, as the learning happens better in a smaller group. No prior training or experience in singing is required. The idea is to come together in the spirit of Kabir and Bhakti, and delve deep into one song, in terms of the words, meanings and also singing it together as it is sung in the folk traditions from various parts of the country. Prior registration necessary at this link. 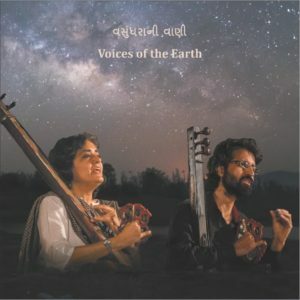 Bringing forth the fierce spirit of fakiri and bhakti in folk music are two sets of musicians from two very different deserts of western India – the salt Rann of Kutch and the Thar desert of Rajasthan: Mavji Jagariya, Saidu Ibrahim and Omprakash Nayak. 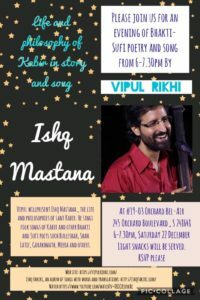 Their songs will bring alive the poetic depth and spiritual force of Kabir, Mirabai, Shah Latif and other poets, interpreted, translated and joyfully shared by Shabnam Virmani and Vipul Rikhi from the Kabir Project, which has been working at the intersection of mystic poetry and folk music for over a decade. 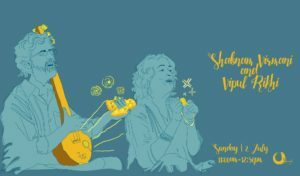 This event explores the poetry of the great 18th century Sindhi Sufi poet Shah Abdul Latif Bhitai, through storytelling, translations and songs. Each story is invested with a deep spiritual charge and significance. 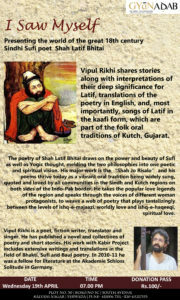 Vipul Rikhi shares these stories along with interpretations of their deep significance for Latif, translations of the poetry in English, and, most importantly, songs of Latif in the ‘kaafi’ form, which are part of the folk oral traditions of Kutch, Gujarat. We invite you to an evening of Kabir music and poetry on 13th April, Thursday, 7:30pm at Phoenix Arena, Hi-Tech City. 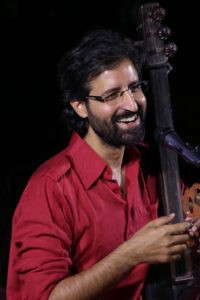 Vipul Rikhi is a poet, fiction writer, translator and singer. 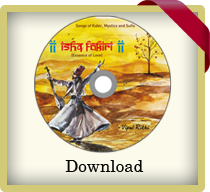 The album ‘Ishq Fakiri’ is a gift. These songs were received as a gift, and they are being passed on as a gift, in the spirit of service. 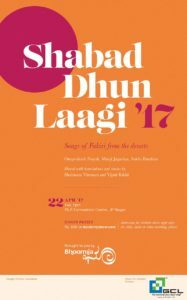 Exploring the poetry of the great 18th century Sindhi Sufi poet Shah Abdul Latif Bhitai, through storytelling, translations and songs. Vipul Rikhi shares these stories along with interpretations of their deep significance for Latif. There will be translations of the poetry in English and, most importantly, songs of Latif in the kaafi form, which are part of the oral folk traditions of Kutch, Gujarat. Time: 4:30 pm to 5:30 pm. 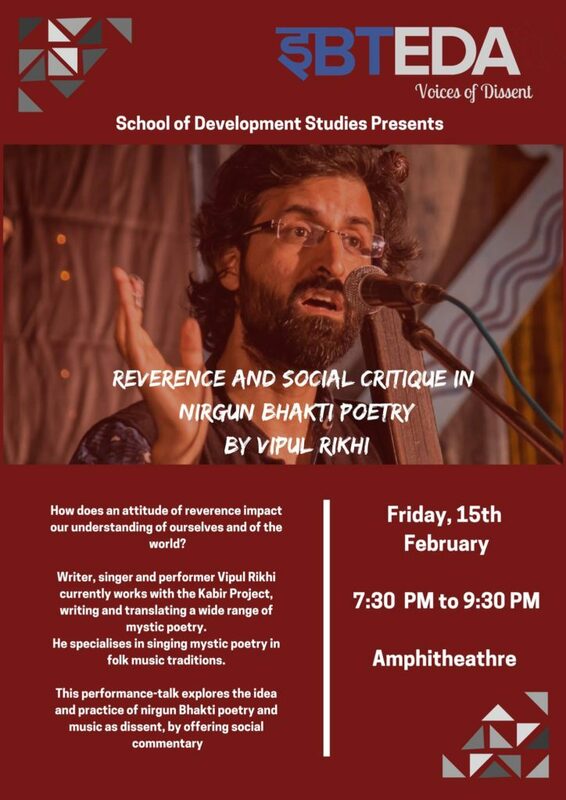 This talk explores the idea and practice of nirgun Bhakti poetry and music as dissent, not just in the sense of offering social commentary and critique around caste and religious oppressions and corruptions, but equally in basing this critique firmly in a sense of the sacred. How does an attitude of reverence impact our understanding of ourselves and of the world? Do we need to question only mainstream fundamentalisms, or also the kind of secular framework which seeks to have no truck with the sacred? 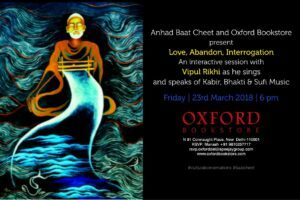 About: Kabir and other Bhakti poets drew extensively on nature to communicate simple yet profound truths, evoking intriguing images in the process. 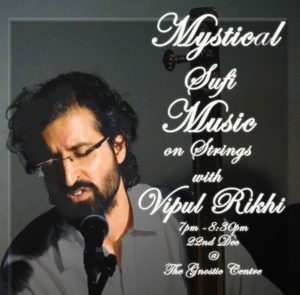 Vipul Rikhi will explore the idea of gardens of the body, through song.